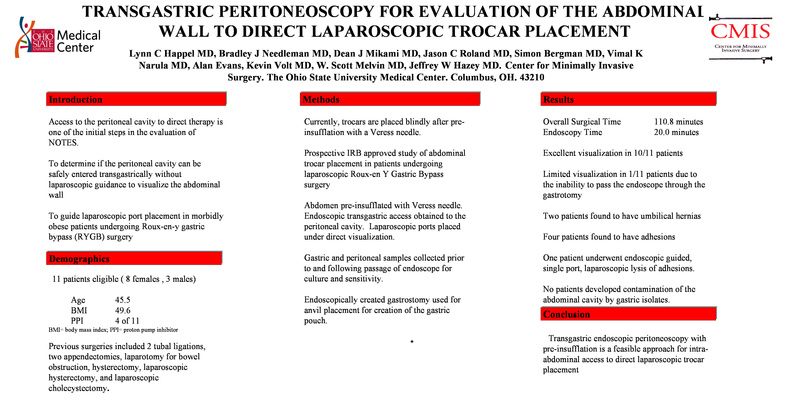 Objective: Access to the peritoneal cavity to direct therapy is one of the initial steps in the evaluation of NOTES. We hypothesize the peritoneal cavity can be safely entered transgastrically without laparoscopic guidance to visualize the abdominal wall and guide laparoscopic port placement in morbidly obese patients undergoing Roux-en-y gastric bypass (RYGB) surgery. Methods: Abdominal trocar access in patients undergoing laparoscopic RYGB is performed blindly after pre-insufflation of the abdominal cavity with a Veress needle. Eleven patients participating in the IRB approved trial had their abdomens insufflated by a Veress needle followed by endoscopic transgastric access to the abdominal cavity. Laparoscopic ports were then placed under endoscopic visualization. Gastric and peritoneal samples were obtained prior to and following passage of the endoscope into the peritoneal cavity and were sent for culture and sensitivity. The endoscopically created gastrotomy was used as part of the procedure for anvil placement and creation of a gastric pouch eliminating an unnecessary gastrotomy. Results: The average BMI was 49.6. The overall surgical time was 110.8 min with an endoscopy time of 20.0 min. 10/11 patients had excellent visualization of the abdominal wall, while one patient had limited visualization due to an inability to pass the scope through the gastrotomy. Two patients were found to have umbilical hernias. Four patients were found to have adhesions, of which one underwent endoscopic guidance for laparoscopic adhesiolysis via a single laparoscopic port. No infectious complications or leaks occurred. No patients had contamination of the abdominal cavity by gastric isolates. Conclusion: Transgastric endoscopic peritoneoscopy with pre-insufflation is a feasible approach for intra-abdominal access to direct laparoscopic trocar placement.